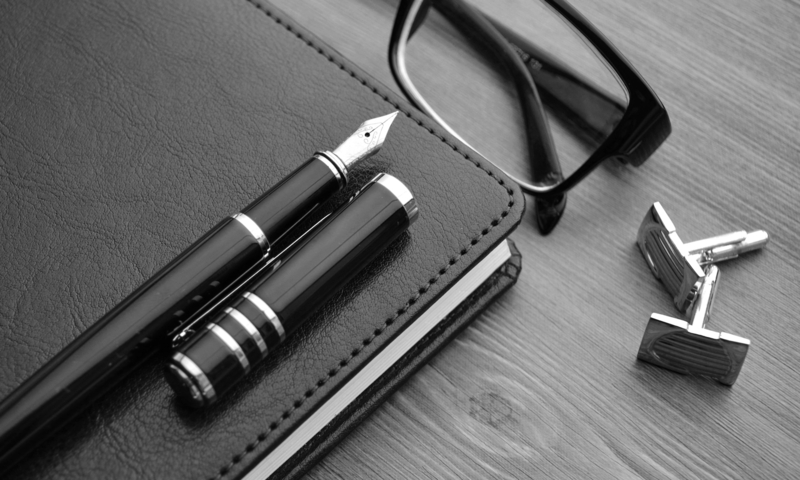 There are times when a good multiple subject notebook is a real asset to keeping well organized. At one time I was simultaneously working on a bathroom remodel, ideas for a website project and collecting information for a trip. Lots of note taking was happening, especially while shopping for bathroom fixtures, paints, etc. To keep my notes organized I used a medium sized notebook with 4 different sections marked by different paper colors. Rather than having multiple little slips of paper with random notes being misplaced never to be found again, this notebook helped me to keep things together and organized. Multiple subject notebooks have a multitude of purposes – taking notes for simultaneous projects, jotting down recipes under different categories, recording passwords (yeah, I know they aren’t supposed to be on paper), keeping track of notes taken during regular meetings with different people, writing down addresses and phone numbers, or even for a to-do list book where goals are organized into subjects such as school, family, work and personal life. In school you can use them to put notes on related subjects into one book or to divide textbook notes from lecture notes. 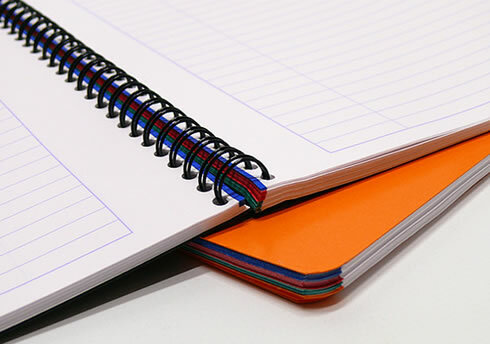 Having a multiple subject notebook can cut down on weight and confusion. I’m sure you can think of many other ways you can use these notebooks to help you stay organized and have everything you need in one book. Some multiple subject notebooks simply use tabs to divide the notebook into different sections. The Clairefontaine Twinbook is a good example of this. The right edges of the pages are cut to create two tabs so that the notebook is divided into two sections. A more complex series of tabs are cut into the large Clairefontaine A-Z notebook with a tab for each letter of the alphabet. 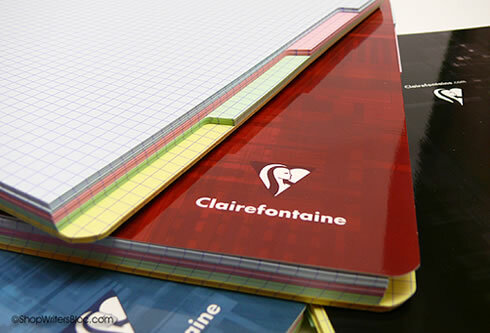 Another notebook with tabs is the Clairefontaine multiple subject notebook. The large size has four tabbed sections, medium size has twelve tabbed sections and the small pocket size has eight tabbed sections. Other multiple subject notebooks use multiple page colors to distinguish different sections. The pages in the Rhodia 4 Color Book each have a band of bold color on the right and left edges to break the notebook up into four clearly marked sections. 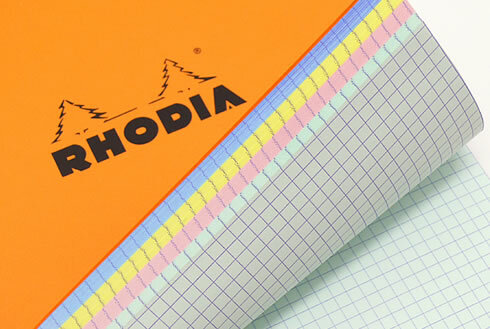 Rhodia also has the top stapled rainbow notepad with four different pastel colors of graph paper. 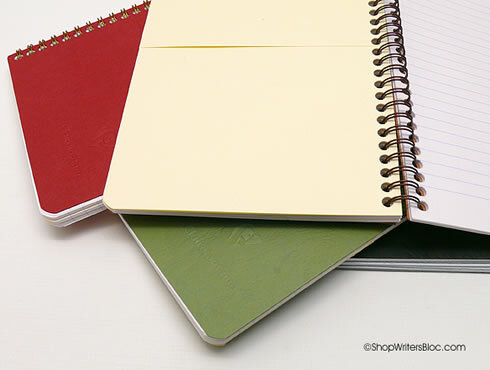 I think the king of notebooks with multiple page colors has to be the Clairefontaine multiple subject notebook. As I already mentioned above, not only does it have the sections divided by index tabs it also has them distinguished by different pastel colors! 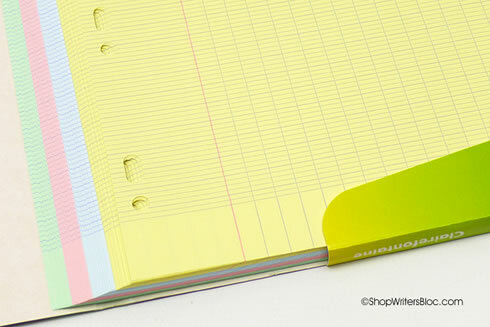 You can get Clairefontaine binder paper in packs with four different pastel colors of either graph or French ruled paper for free style organizing in a binder. 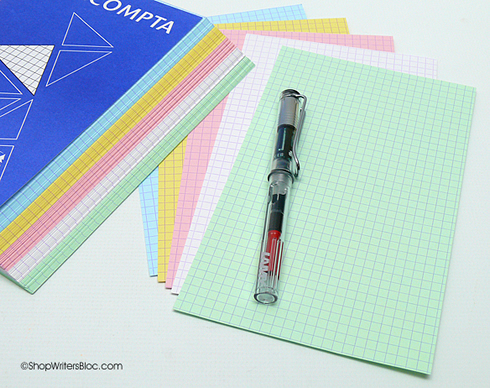 Exacompta graph index cards are not notebooks but they are worth mentioning because they come in packs of four pastel colors plus white to create index card organization. These would have been quite useful for me in high school for a particular English class where we were required to use index cards to jot down facts (and their source) that might be used for essays. Any index cards with facts that we decided not to use in the actual essay were discarded, but the facts we included in the essay were saved and then the index cards were organized in the order the facts appeared in the essay. It made creating footnotes much easier (not that I appreciated this much at the time). 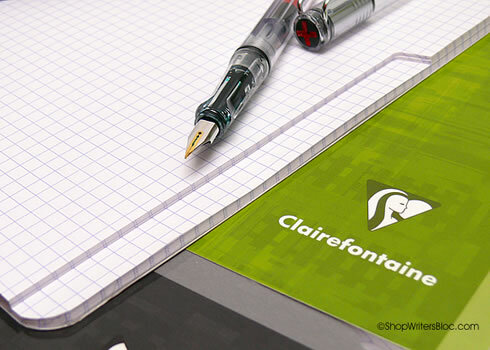 If you need to have organized notes while at the same time collecting receipts, notes or other pieces of paper, there’s a Clairefontaine notebook with pocket dividers! The three dividers each have pockets on both sides and divy up the notebook’s 60 sheets into four sections of 15 sheets each. Do you use multiple subject notebooks? What’s your favorite? What do you use them for? Love the Exacompta Index Cards! Hard to find grid index cards in the States. I used the Rhodia 4 color book for work! It was a great way for me to take notes on all my client calls and have a designated section for each client.